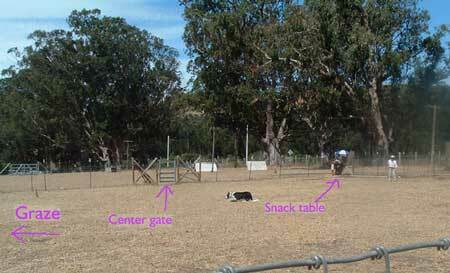 Our first attempt at AHBA Herding Ranch Dog was in November, 2002. This time I made a animated picture of the course to help explain it. "Everybody" says how much we've improved over the intervening two years! But darn it all the description of my doing the course sounds awfully familiar. The big difference is that I finally got a qualifying score! And fourth place out of seven dogs. Saturday was a different story. I ran out of time, therefore did not qualify. It was an interesting, fun and quite doable course. One change that has happened over the last two years is that I've become a better stock handler. Another it that I'm better at assessing my dog. So I correctly predicted the places where we would do well, and those where we would have trouble. Although, as always, Tsuki did hold a surprise for me. More on that later. Let me show you the course. Dog pushes sheep out the open gate into the next arena. Dog holds the ten sheep someplace. Where is up to the handler, the correct place depends upon how the sheep are reacting to the particular dog. There are five more sheep in the pen. They get joined with the original ten. Take all 15 sheep to the graze area. Drive the sheep, fetch the sheep it doesn't matter. Leave the dog to hold the sheep at the graze. The handler goes across the arena to the snack table. How long you have to stay there depends on your level. When the graze hold is completed take the sheep out the center gate into the next arena. Make a left turn through the panels. Fetch, drive, walk through the panels, it doesn't matter. Settle the sheep. Handler and dog move away from the sheep. How far depends on your level. Send the dog to gather the sheep then take them counterclockwise around the handler post. Sheep need to go through the panel. How you get them through depends on your level. Sheep need to get down to the hold pen. How you get them there depends on your level. There is no actual "hold" at the hold pen. As soon as the sheep are all the way in the dog needs to take them out again. Dog brings the sheep across the arena to a gate behind the handler post. Open the gate. Sheep go down the raceway into another arena. At the sort gates sort five sheep to the right, into the barn. Which five depends on your level. The other ten go to the left into the last arena. I assisted the judge both days (different judges) by timing each run. Sometimes you get helpful tips even if nothing more than the judge muttering, sometimes not. Saturday's judge had judged me at least once before but didn't remember it. Sunday's judge did remember it, and has also been at various other trials when I've run Tsuki. So she had a comment to make "I've noticed, and I've told you before that Tsuki does better when you just let him work and don't crank down on him." Which is true, but tough to do as he can be a little intense. On Saturday, well it started a little wild. I sent Tsuki to pick up the sheep and they bolted. I'm not sure I even attempted the turn around the handler's cone, but I did get Tsuki under control and "fetched" the sheep out the gate. (That means I led the way, the sheep behind me, Tsuki behind them.) I put the sheep in the "suggested" location for holding while I went to get the rest out of the pen. It was a bad choice, I think. My original plan was to have the sheep against the center gate. The suggestion was to have the sheep somewhat closer where the sheep inside the pen could see them. The general idea was to hope the sheep would come out on their own. If not the dog (and/or handler) would have to go get them. Well we had been warned that the sheep outside might try to get inside. And that's what happened. I tried to get Tsuki to block them, but I did it wrong and they just ran in faster. And I wasn't in the right place to stop them. At our level I had two choices. Leave my dog outside, go in and push the sheep out or take my dog's collar and walk in with him. Well I know from experience that taking Tsuki into a small pen is not a good idea, but I didn't think I was going to get all 15 out if I left him outside. First sheep out would take one look and refuse to budge. So we had been told at level one we could hold the collar. Unfortunately I didn't notice that we were told to "comebye" to push the sheep out. I went the wrong way. Oh the sheep wanted to leave. They wanted to leave very badly, In fact one sheep decided that the gate wasn't wide enough, so it made its own gate. Well OK, they were out. I took them down to the graze, set Tsuki up. Told him to stay. I went to the snack table and touched it. "STOP" isn't a command Tsuki does well at, but "Stay" is a different matter. I wasn't surprised that he held his stay nicely. I went to the center gate, opened it, and told him to fetch the sheep. They were only too happy to come through the gate. We always have trouble with panels and this time was no exception. Tsuki still has no consistent "stop" and no consistent "easy." At least he has them sometimes. Some how I did get the sheep through the panels and to the settle. I don't remember what happened around the handlers post. I think we went through the second set of panels OK. At some point I downed him and considered leaving. He seemed to get the drift and settled down - a bit. We got the sheep into the hold pen OK. And I held his collar when we got them out. Not so much because I needed to hold his collar, but more because the judge had said (a) at level 1 you can hold the collar and (2) don't do things you don't have to, don't work above your level. 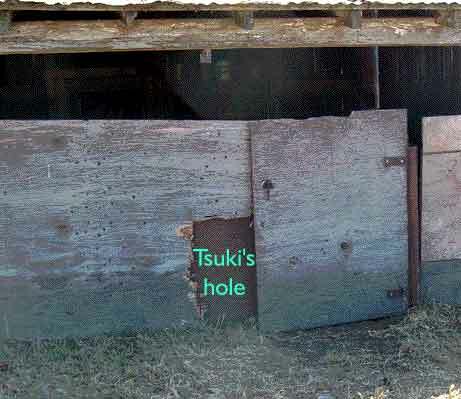 Tsuki's gate work is usually good. He generally settles down around the gates, rarely pushes the sheep against them, and usually doesn't chase the sheep through. This run, as ragged as it was, was no exception. The final trouble came at the sort gate. The last time I did a HRD trial at this facility that was our highest scoring part. This one was a bit different. The sheep decided they didn't want to come anywhere near the sort gates. The problem was that having Tsuki push them up was going to get them wanting to all race through. And I needed to sort 5 (any five) to the right gate and ten to the left gate. Now if Tsuki were cooperating that wouldn't be a problem. But he was being too pushy. I decided since I didn't have to pick sheep it was easier to get most in to the left, then the five to the right, then if I miscounted any remaining to the left. Bad choice. I got nine sheep to the left properly. Then I had six left. So I opened the right gate. Then Tsuki decided to "help". Well when I shut the gate to prevent number 6 from going in, it decided to turn around and take off back down the raceway we had come in. I first waited to see if it would come back. It didn't. Then I decided to leave Tsuki and go get it myself. That way it wouldn't panic. It didn't, but it wouldn't come. *Sigh* so I went and got Tsuki. It came out, then ran the wrong way. Then I ran out of time. The judge's comment afterward was that I was fighting him too much on the "down" and that it might be better to have him stand. And he's right. And I've been trying to retrain myself to do just that. But that comment together with the comment from the other judge about letting him work and not put too much control on him and we are all set for Sunday's run. Which is exactly what it was. I literally ran about half the course. I do try to learn from past mistakes, and most especially to pay attention to tips provided by judges. The judges aren't always right, but you if you ignore the advice what you decide to do instead better work. So we were somewhere in the vicinity of the cone and out the open gate in a flash. This time I held the sheep further down than the day before. I went to open the pen to get the other sheep out. The first group considered making a run for it. I moved Tsuki just a bit, and they reconsidered. I had Tsuki at about the same place I had the day before. The sheep inside the pen couldn't see him. But they didn't want to come out. Darnit. OK, THIS time I'm going the right way. So I call Tsuki to me. We quickly cross in front of the open gate. Hey, these sheep aren't stupid. They've figured out that if they don't come out the dog is coming in. So they come flying out right past us. We get the sheep down to the graze. I had Tsuki stand-stay to hold them. They thought about coming up the fence line toward the snack table. I succeeded it getting Tsuki to move only a couple steps. The sheep reconsidered and glared at him. At this point some competitors lost the sheep back into the first arena. They thought about it, but decided against it. (You can tell what the sheep are thinking by where their head and ears are pointing). I walked to the snack table, and touched it. Level 2 and 3 handlers had to stay 30 seconds, but us in level one could leave right away. I had Tsuki down, then I opened the center gate. An upright dog like Tsuki can frequently move the sheep merely by standing up. That was my plan. It didn't quite work, but he only needed to take a step or two and the sheep made for the gate. This picture is of a level 3 team. The other comment the judge had made was that some of us level 1 handlers were driving (sheep and dog ahead of us) when we should have been fetching (sheep between dog and handler). Well the only way I was going to keep ahead of the sheep at the rate Tsuki was moving was for me to move faster. Because Tsuki didn't think HIM moving slower was an option. So I ran. I ran to the settle, we actually settled them. I got him away, we fetched I ran through the panels down to the handlers post. I got them around the handler's post, down through the panels, and into the pen. These sheep aren't so dumb. I put my hand on Tsuki's collar to depen them and they decided to leave. I run down to the gate behind the handler's post. Somewhere along the way I lost my hat. I didn't care. Tsuki did his usual good hold at the gate. Then we were through the gate, down the raceway, and into the final arena. The sheep decided to be in the same place as the day before. I move Tsuki, and this time he did what he was told. This time I put five sheep to the right, then opened the gate to the left. Humpf, Tsuki decided to help and he got up. Sheep tried going through two or three at a time. They don't fit that way. But they made it. I slammed the gate. Done! I had to laugh when I came out and someone commented, seriously, that they were sure that this time I "made time." Well, yes. We had LOTS of spare time. The Level 1 handlers had 15 minutes to do the course and I took just over 9 minutes. We were rough, we were inelegant, but we made few mistakes of a kind that needed fixing (redoing). I'm quite sure we had the fastest time at our level. This is not necessarily a good thing. Faster is not necessarily better. Often a fast run indicates a smooth run, but sometimes it means one like ours where the sheep are getting pushed a little too much, but still basically going where they are supposed to go. Happily following the judge's advice and giving my dog a little more rein resulted in a qualifying score. Not only that but we took 4th place out of 7 dogs in the class. We have lots of work still left to do, but we are progressing.